I have applied for a paddlefish tag numerous times and fortunate enough to draw several tags. In years past, My daughter Mieke Slaba, Wagner, S.D. accompanied me, unfortunately, this particular year, she did not receive one. Our other Team members and I planned on meeting at the Nebraska boat ramp just below Gavin’s Point Dam. Once again, the weatherman had tricked us into believing we’d have a warm sunny day to do some Paddlefish snagging. When we arrived at Gavin’s Point Dam that morning, it was misting, wind from the northwest with no sun in sight. Team Outdoorsmen Adventures members Marlyn Wiebelhaus, Wiebelhaus Guide Service would run the boat, Larry Myhre on the camera with me doing the snagging. The Paddlefish season was in high gear as could be seen by the number of anglers on the shore and in boats who were equipped with long heavy rods, big reels capable of holding huge quantities of heavy line were chucking 4 ounce lead weights and 2/0 treble hooks. South Dakota state record, a 127-pound, 9-ounce fish came from Ft. Randall, In Nebraska, and the record came from the tail waters behind Gavin’s Point Dam, and it weighed 113 pounds 4 ounce fish. They are found in the Yangtze River and its tributaries in China and in the U.S. the Missouri River and its tributaries. Paddlefish, with their torpedo like shape and their powerful tail, are able to move through the water quickly. They are a prehistoric looking fish; have no bones in their body, ONLY one long cartilage running along their back from the head to their tail. As Marlyn lifted the fish in the boat, he commented, “it’s a tagged fish” and as I held the small fish up, Marlyn jotted down the tag number before I released it back into the water. 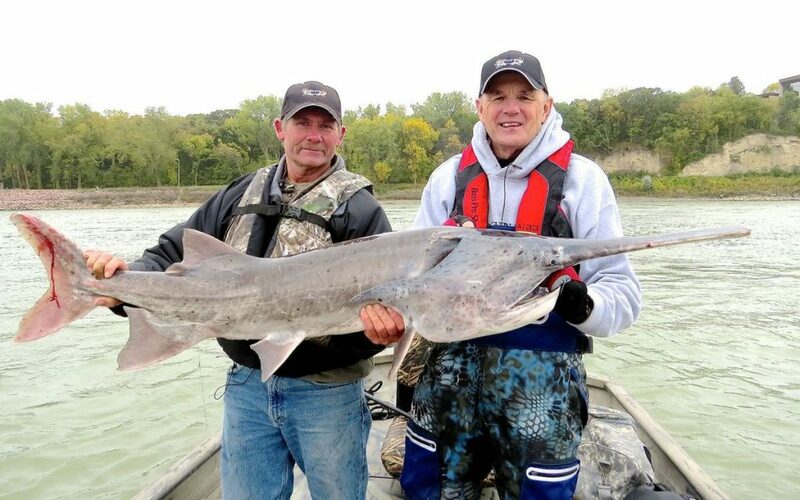 Bringing even a small paddlefish like this one to the boat can be tough, especially if hooked in the back or tail, as you’re not only are you fighting this powerful fish, you are also fighting their huge gills that flair out, filling with water. It didn’t take long for me to hook into another fish, and the way it was taking line, I knew it wasn’t the size of those I’d taken earlier. The fish peeled the line off the reel as I reared back and cranked on the reel handle, trying to gain back some of the line I’d lost earlier. Slowly but surely, I was gaining on the fish and as he popped to the surface all of us in the boat knew this one would be a slot fish. A slot fish is one that measures between 35″ to 45″ between the front of the eye to the fork of the tail and is a fish, which has to be released. It seemed as if we were in an area of the river where the bigger fish were holding as the next fish I hooked into was another slot fish just over 44″. As Marlyn turned the boat to make another pass across the river, my rod bent over sharply and I was pulled towards the back of the boat. As I gained control of the rod, I said, “I think it’s a snag” with Marlyn indicating, that’s strange, I don’t think there’s any snags out here, it must be a fish. Marlyn backed off the throttle keeping pressure on the fish as I bore down on the rod, gaining about as much line as the fish took each time he took off. When the fish surfaced, Marlyn thought it might be over the slot and as we lugged the fish into the boat, we knew it was the big fish of the day. Team Outdoorsmen Adventures Member and Guide Marlyn Wiebelhaus, Wynot, Neb.and author with the largest paddlefish of this trip, unfortunately it was inside the slot, measuring 43 3/4 inch from the eye to the fork of the tail. 1/4 inch short of being a keeper. Well, the tale of the tape would let us know and as Marlyn brought the end of the tape to the front of the fish’s eye, I slid the tape along the fish to the fork of his tale. It measured 44 ¾” just ¼ inch short of being a keeper. After a couple of pictures, we slid the big fish back in the water where it quickly dove to the bottom. Now it was looking as if releasing some of the smaller fish we took earlier may not have been such a good idea. Once Marlyn brought the boat around as I started pumping the heavy rod, back and forth, ripping the 2/0 hook through the water. I felt a bump, reared back on the rod and felt no resistance, thinking I’d missed the fish, I started to back off on the rod as Marlyn said, “I think he’s still there, he’s just running towards the boat. I quickly started taking up line, hoping to catch up with the fish, which I did just as he was roaring past the back of the boat. This fish wasn’t putting up the fight of the last two fish, and as he broke the surface, we thought it would be under the slot and one we could keep. He was right, as the fish was 33″ long and the fish I would put my tag on and take home, one my wife and I would enjoy having part of for dinner a few days later. These fish as well as others are feeling the effect of the invasive Silver and Big Head Carp as they eat all the time and are much more adept at straining the zoo plankton from the water than are the paddlefish. Because Paddlefish do not feed like other fish, feeding on plankton, the only way they are caught is by snagging them. Snagging paddlefish can be a lot of work, but when it comes to fine eating, there is none better. When cleaning the fish, pay close attention to the red meat, which is their lateral line, and the oily red layer found on both sides of the fish. When cleaning the fish, you will need to make sure that all of the red meat in the fish is removed and once cleaned properly and prepared are some of the finest tasting white flaky meat you’ll find. 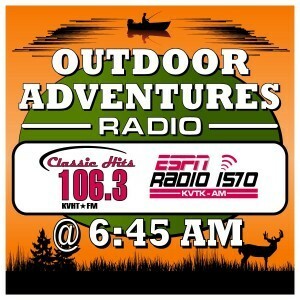 As usual, Larry and I had a great time spending time on the water with Marlyn, as there is no one that knows the river and the area better than he and one we’d recommend you contact if you’re looking at doing some bowfishing, snagging or archery turkey or deer hunting.